The Doctor is in, so let’s take him out! It’s not that you dislike the Doctor. It’s more of a seething hatred. He wronged you and we’ll leave it at that. Tonight you will attend a dinner party which will prove to be the perfect opportunity to take your revenge. Unfortunately, there are others attending who have the same idea. Kill Doctor Lucky 19.5th Anniversary Edition, designed by James Ernest and to be published by Cheapass Games, will reportedly be comprised of 8 Character cards, 72 Playing cards, 8 Character pawns (representing the 8 characters), 1 Doctor Lucky pawn, and 1 game board (that represents Lucky Mansion). As this is a review of a prepublished version of the game, I cannot comment on the game component quality. Nor can I comment directly or indirectly on the game’s artwork and layout. The packet of information that came with the game components clearly states that nothing we were provided was final. I can tell you that artists Israel Evans has been tapped to provide the final artwork for the game. You might be familiar with his work in Get Lucky. If you have played the original Kill Doctor Lucky game, you might be curious about what is different. Here is a summary of the changes. Hallways no longer count as steps and Character pawns can no longer end their movement within them. 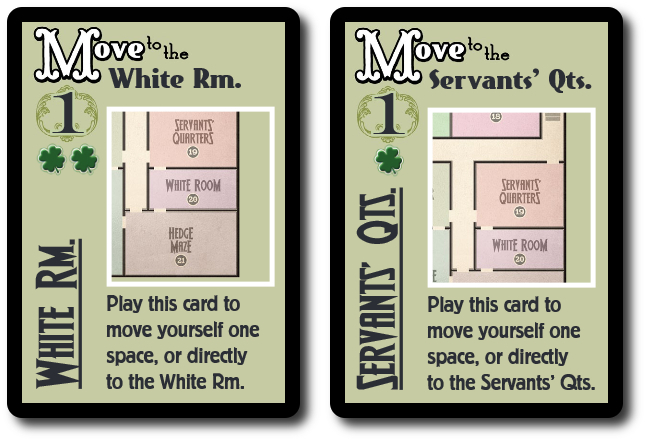 Move and Room cards have been consolidated into one card type. Move and Room cards cannot be used on Doctor Lucky. Cards can only be drawn when there is no sight lines on the player’s Character pawn (i.e. “out of view). Cards can be played before and after drawing cards. The previous version of the game allowed players to stay ahead of Doctor Lucky and draw cards almost indefinitely. This is no longer possible due to being seen or running into another player. Weapon cards now add to the Character’s base Kill point value of “1” instead of replacing it. Luck is now found on all cards types, not just “Failure” Play cards. “Spite” has been replaced by “Reason”. There is now only 1 discard pile for all cards played. There is now 1 card for every Room and one Weapon for every Room. Note: This game set up and play is for a 3 to 8 player game. Rules for a 2-player game are summarized in the “Game Variants” section of this review. To set up the game, first place the game board in the middle of the playing area. All the players should be able to easily reach the game board during game play. Second, shuffle the Play cards and cut them until a “Weapon” or “Room” Play card is revealed. Place the Doctor Lucky pawn in the matching room found on the game board or the “Perfect Room” if a “Weapon” Play card is drawn. Return the card and shuffle the deck again. Then deal 6 cards to each player, face-down. Players should look at their cards, but keep them hidden from their opponents. Place the remaining deck of Play cards face down. This is the draw deck for the duration of the game. Third, have each player select a Character card or randomly deal 1 Character card to each player. Players place the matching colored Character pawn in the “Drawing Room” on the game board. 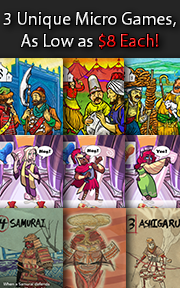 Each Character card is double-sided, allowing players an opportunity to select 1 of 2 personality choices. Any Character cards and pawns not used are returned to the game box. Fourth and depending on the number of players in the game, certain sections of the game board are removed from play. For example, in a 3-player game both the east and west wings of Lucky Mansion are no longer accessible to either the good Doctor or the players. If playing with 6 or more players, all of the rooms in Lucky Mansion are open. 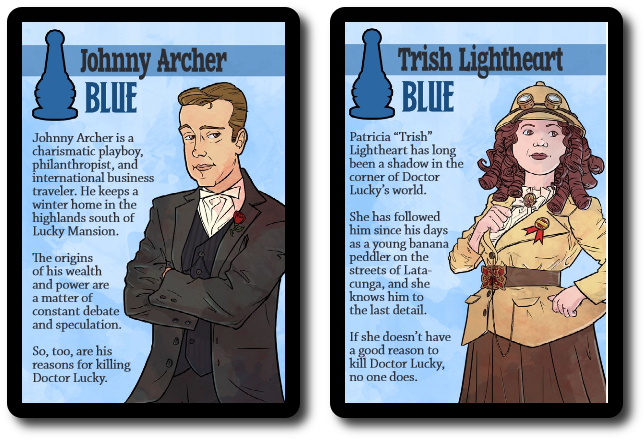 Kill Doctor Lucky uses “sight lines” to help players determine if their Character pawns are spotted by other Character pawns. Thematically speaking, being out of an opponent’s sight line means the player is free to go about doing whatever it is they like without being caught or drawing attention to themselves. In some ways, the sight line is very much like the traditional “Line of Sight” (LOS) used in miniature combat games, but without being so rigid or formal. Sight lines play two very important roles in the game. First, if a player is out of sight, they can draw Play cards. These cards are necessary to improve the Character card and to take out Doctor Lucky. Second, players cannot win the game unless they can kill the Doctor in private. Put another way, players cannot up and kill Doctor Lucky in the middle of a crowded room. For the most part, sight lines go perpendicular through all doors and stairways. Character pawns in one room are visible to any other Character pawn in an adjacent room. Well, not so much “visible” as “known”. The only real exception to this rule is the balcony section of the “Gallery” room. This special section of Lucky Mansion does not allow Character pawn movement, but does allow a sight line to many different rooms. The balcony also blocks the sight line between two other rooms, making it a good place to quietly hide and contemplate murder. For example, consider the following illustration of the game board. 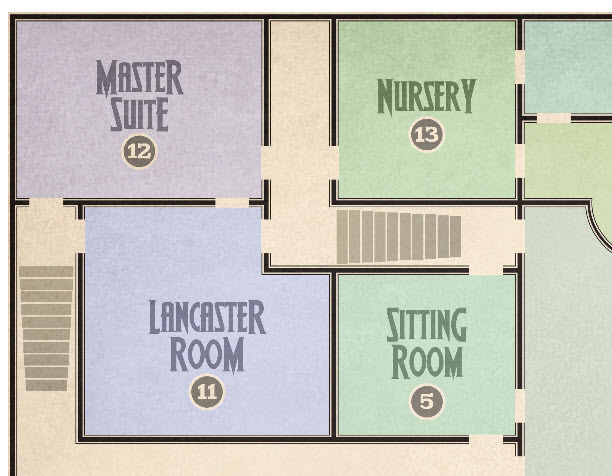 Any player with a Character pawn in the Master Suite knows about any other Character pawn in the Lancaster Room and the Nursery, but not in the Sitting Room. Kill Doctor Lucky is played in turns with no set number of turns per game. A player’s turn will also consists of an optional move action and possibly more. The player can move their Character pawn from one Room to another. Moving from one adjacent Room to another is permissible through doorways. If the Character pawn is moved outside the Room to a Hallway or Stairway, it must be moved to any connected Room since Character pawns cannot stop their movement in the Hallway or on the Stairs. It should be noted that this action is identified as “step 1”, but it can be taken after completing other actions noted below. There are several possible actions the player can take that depend on their Character pawn position in relationship to other Character pawns and the Play cards they have in their hand. “Room” Play cards allow the player to move their Character pawn 1 or 2 more Rooms. “Room” Play cards can also take a Character pawn to a specific Room directly. Once played to the discard pile, the player moves their Character pawn accordingly. There is no limit to the number of “Room” Play cards a player can use on their turn. If the player opted to play their “Room” Play cards at the start of their turn, they can still take their optional move action. If the player finished their turn, meaning they are all done taking actions, in a Room without any other Character pawns and no other Character pawn has a sight line on the player’s Character pawn, they may draw 1 Play card and add it to their hand. If at anytime the Play draw deck is exhausted, shuffle the discard deck to create a new one. 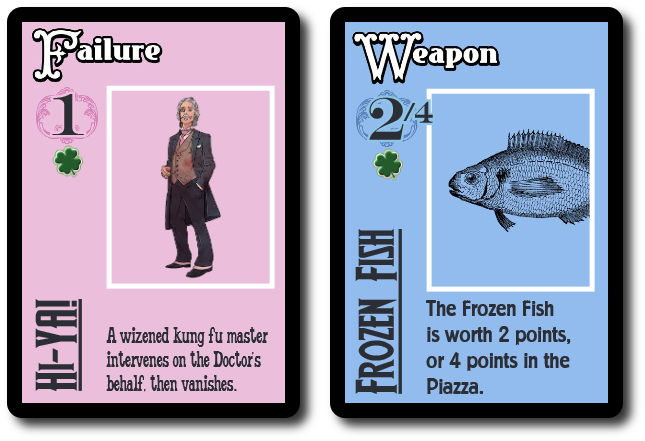 “Weapon” Play cards improve the odds of the player’s Character successfully bumping off Doctor Lucky. 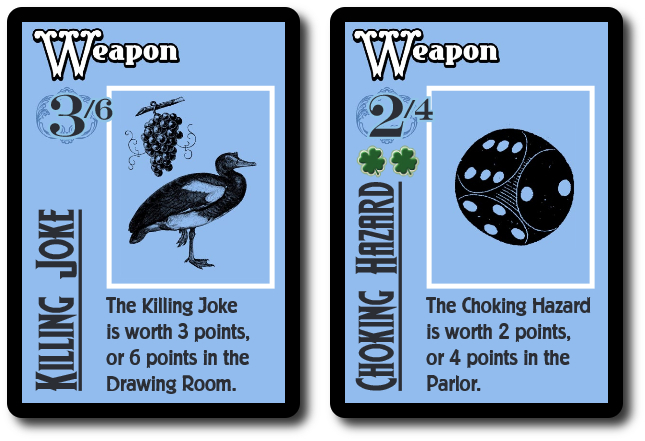 The more “Weapon” Play cards the player adds to their Character card, the better equipped they are for murder most foul. Some “Weapon” Play cards are more lethal in specific Rooms. If the player’s Character pawn is alone in a Room with the Doctor Lucky pawn and no other Character pawn has a sight line on the player’s Character pawn, the player can attempt to end Doctor Lucky. By default, each Character card has a 1 Kill point. “Weapon” Play cards add additional Kill points. But murder is not that easy. Once the player announces they are going to murder Doctor Lucky, the player’s opponents have an opportunity to foil their plans by giving Doctor Lucky luck. Luck is represented by the shamrock symbol that is found on many of the Play cards, including the special card type “Failure”. Each shamrock symbol is equal to 1 Luck point that cancels 1 Kill point. Starting with the opponent on the active player’s left, each opponent has 1 opportunity to play as many Play cards as they like to improve the luck of Doctor Lucky. The goal is to have more Luck points than Kill points. Opponents can opt to pass, but do not have to give any reasons why they decide to do so. If the combined total of Luck points is less than the total number of Kill points, the Doctor is no more. However, and more than likely the case during the first half of the game, the doctor will survive. If the Luck points are equal to or greater than the total Kill points, the doctor lives on. The would-be murderer then takes 1 of any of the cards played against them and places it underneath their Character card. This is a permanent +1 Kill point and will remaining with them for the duration of the game. These collected cards are referred to as “Reasons”, and the more reasons the Character card has to murder Doctor Lucky, the more likely they will succeed. After the player has completed all their card plays and moves, their turn is over. The Doctor Lucky pawn is now moved to a new Room. Doctor Lucky follows a set path, moving from one number to another in sequential order. The only exception to this rule is if there are Room areas closed off. In which case, the Doctor Lucky pawn moves to the next highest numbered Room area, no matter where that might be. If there is only 1 Character pawn in the same Room as Doctor Lucky when the Doctor has stopped moving, it’s now that player’s turn. If there are 2 or more Character pawns in the same Room as Doctor Lucky, the next player to take their turn is the next player in turn order sequence that is also in the same Room. Technically speaking, a player can have several turns in a row, but only until the player’s Character pawn is moved into a Room occupied by other Character pawns. At which time, a new player will be given a turn since the next player to have a turn is based on the next player in turn order sequence after the last active player. Once the next player is determined, the game continues as described above. The game continues until a player attempts to kill Doctor Lucky and their opponents cannot stop them. This player wins the game. There are a few cases where some opponents incorrectly assume another opponent will add more luck only to painfully discover that their assumptions are incorrect, resulting in one very dead doctor. In which case, this individual could be considered the loser of the game, since they had luck and didn’t play it. There are a number of game variants available to players to try. Here is a summary of those that will be available right out of the game box. When playing Kill Doctor Lucky with only 2 players, 2 “ghost” players are introduced. Ghost players do not have a hand of cards and alternate taking turns with the “live” players. Ghost players are moved by the live players and are used to help watch rooms, but they can also kill Doctor Lucky if they have a chance. This means a ghost player could win the game, which would be weird. Doctor Lucky has a precocious cat named Patience that likes to roam around the mansion. The cat doesn’t care one bit what is going on and will not stop a player from killing Doctor Lucky or drawing cards. What Patience does do is distract players, ruining their outbound sight line. Thematically speaking, Patience demands to be petted. This adorable cat can be moved by any player on their turn to any room in the mansion. This game variant flips the script and challenges the players to survive the undead Doctor Lucky who is stalking them through the house. Doctor Lucky cannot be killed (again) and luck is now used to save a player’s Character. In a strange twist of irony, players can attack each other and only 1 player can win the game by being the last “living” person in the mansion. 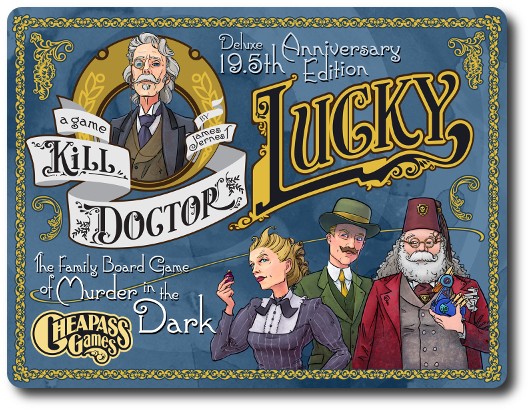 To learn more about Kill Doctor Lucky 19.5th Anniversary Edition, visit the game publisher’s website or visit the Kickstarter campaign. A number of the Child Geeks had played Clue before and were excited to play a different version of a game they enjoyed. For the most part, the only game rule that was difficult to grasp at first was the sight line. They understood how everything moved and how murder attempts were conducted, but it was the line of sight to each other that always threw them. They eventually got it, but it took longer than I expected. As one Child Geek put it, “The only problem I had in this game was staying hidden or remembering how to stay hidden.” Once the Child Geeks understood how it worked, they could play the game on their own and did brilliantly. 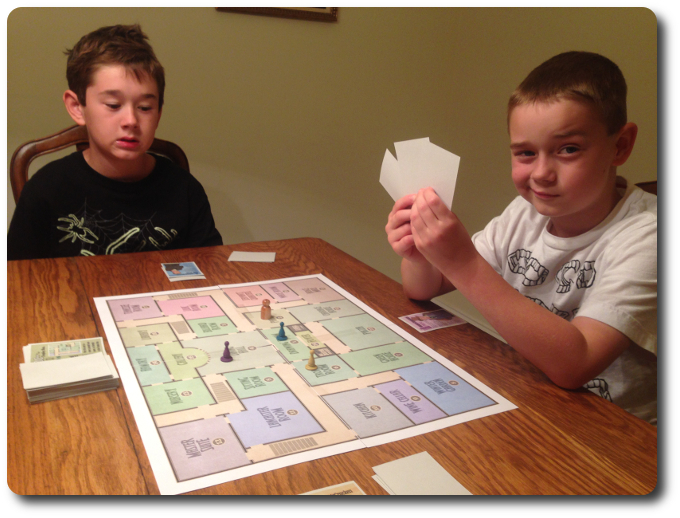 According to one Child Geek, “I like this game better than Clue. It feels a lot more exciting and you have to be really sneaky.” All the Child Geeks enjoyed themselves and laughed as often as they growled in frustration. Nothing is more frustrating than having all of your opponents gang up on you to save the Doctor. When the games were over, the Child Geeks voted to approve Kill Doctor Lucky. The Doctor continues to elude my children, but they remain determined, as it’s only a matter of time…. The Parent Geeks weren’t sure at first if putting a game in front of their children that had the single purpose of murdering another character was a good idea. As one Parent Geek put it, “The game’s theme is dark and a bit disturbing. I want to play it first with adults before I put it in front of my children.” Play it we did and all the Parent Geeks found Kill Doctor Lucky to be a light but challenging game of tactical movement and shrew card plays. They loved it. According to one Parent Geek, “I’m not big on games where you have to compete directly with other players, but I found this one very entertaining. It’s dark humor kept me smiling as I stalked the house looking for the Doctor.” Not all the Parent Geeks felt that the game was appropriated for their families, but they enjoyed it enough to want to play it again with their peers. When the good Doctor was six feet under, the Parent Geeks voted to approve Kill Doctor Lucky. The Gamer Geeks knew all about Kill Doctor Lucky and considered it a “classic”. As one Gamer Geek put it, “This is a classic game that has its faults, but it has yet to be played by me and not enjoyed.” The Gamer Geeks were pleased by the rule changes and the general “improvements” they found in the game as a whole. According to one Gamer Geek, “An improvement on the original and still just as dark and comedic as ever. I played this as a kid and I still want to play it as an adult. Who knew that murdering Doctor Lucky could be so much fun for so long?”. After all the games were over, the Gamer Geeks very quickly voted to approve the game so they could get back to playing it. The biggest hangup any player is going to have with the game is the game’s theme. There is no blood or gore, of course, but there is no denying the fact that all the players are taking on the roles of murderers who are stalking their prey, which happens to be an old and bumbling gentleman. That was found to be disturbing enough to warrant extreme caution by some Parent Geeks and flat-out banning of the game with others. As I have said many times before, parents should review the game before putting it in front of their children. Just don’t be a pest about it. I was first introduced to Kill Doctor Lucky in 1996 when I was attending Gen Con and wanted to pick up a game to play. I came across the Cheapass Games booth and grabbed a game that came in a plastic bag. Man, was it cheap. I think I paid $12 for it. I took it home, opened it up, and laughed all night with my friends. I found the game to be a twisted version of Clue and I loved every second of it. Sadly, that game was lost in a move and I haven’t found a copy of the game since. Now we have the anniversary edition and I, for one, am very excited to be hunting the Doctor again. Kill Doctor Lucky 19.5th Anniversary Edition is an improvement on the classic, adjusting a number of the original game’s rule to create a more streamlined and enjoyable experience. The original game is still here with all of its dark humor featuring the lovable Doctor Lucky everyone is attempting to violently end. This game is an enjoyable mix of Hide-And-Seek and Tag Your Dead with friends and family that never ceases to entertain or frustrate, resulting in an excellent game filled with morbid humor and genuine laughter from everyone around the gaming table. 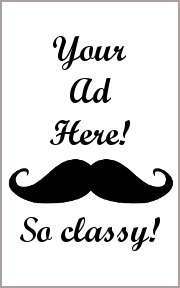 Do give it a try when you get the chance. Tagged Child Geek Approved, Father Geek Approved, Gamer Geek Approved, Humor Games, Murder Mystery Games, Parent Geek Approved, Prepublished Games. Bookmark the permalink.